First Minister Nicola Sturgeon has set a new target to cut child obesity in Scotland by half by 2030. At present, 29% of children in Scotland are at risk of being overweight, and 14% are at risk of being obese. 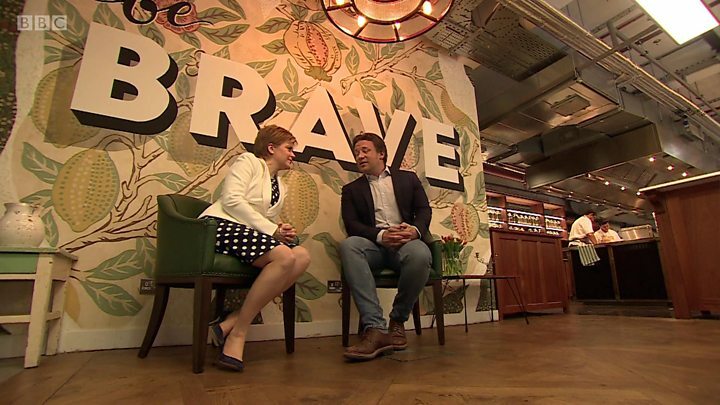 Ms Sturgeon announced the new target in London alongside celebrity chef and campaigner Jamie Oliver. The two discussed action to tackle obesity and unhealthy eating, which Ms Sturgeon called "a serious public health issue which cannot be ignored". Children from deprived areas are nearly twice as likely to be obese, with levels among Scots largely unchanged over the last decade. The Scottish government is to set the new target in a healthy weight and diet plan, due to be published in the summer. It is to include action to restrict promotions and advertising of junk food, including multi-buy deals on unhealthy products. Ms Sturgeon said: "Evidence shows obese children are likely to stay obese into adulthood and become more likely to suffer health problems such as diabetes and cardiovascular diseases at a younger age. "Our guiding ambition is to halve child obesity in Scotland by 2030 and we'll outline in our forthcoming healthy weight plan how we will develop the necessary actions to achieve this, and help everybody make healthy choices about food." Mr Oliver said he looked forward to seeing the "strong multi-layered strategy". Scottish doctors welcomed the new target to cut child obesity in half by 2030 but said achieving it would require "substantive action". Chairman of BMA Scotland Dr Peter Bennie said: "Obesity is a major public health challenge that we must do far more to address in Scotland. "Almost every doctor working in the NHS today will be dealing with patients who are overweight or obese and who will often have additional health needs as a result. "Restrictions on marketing of unhealthy food and drink, better labelling, changes to planning policy, and the provision of free fruit and vegetables to primary school children are all important actions that doctors are looking to the Scottish government to include in their coming obesity strategy."